January has come and gone faster than you can say “New Year’s Resolution”, and the big question remains: are we going to stay true to our healthy lifestyle changes or fall back into the endless pit of cheese, grease, and calorie-induced temptation? While I like to think being Paducah’s ‘Food Dude’ is a viable (albeit not a completely “wise”) excuse to continue shoving loaded nachos, wings, burgers, and pizza into my face, a change of pace can always be a good thing! That’s why our crew decided to pack up and head to the land of good decisions – Paducah Meal Prep! Paducah Meal Prep (or ‘PMP’ for short) is owned by a law-enforcing health guru by the name of Nathan Antonites. It all started during one of the Paducah SWAT team’s biggest loser challenges (a type of challenge that Nathan was notorious for winning). They decided to buy their food in bulk and make their meals together with Nathan acting as the food-based Superman of the local Justice League. Nathan realized he might be on to something when one of his fellow officers won the challenge by losing an astonishing 40+ pounds. This conquest over calories ignited a flame within the community and put Nathan’s prepping prowess on the map. Before long, people he’d never met before were reaching out to get a taste of his macro magic. Nathan’s extensive culinary background during his military days only fueled his dream further. While on deployment, he ran the midnight and breakfast meals which easily fed around 2,000 people. The processes of planning, cooking, and organizing simply came naturally to Nathan. The health guru’s dojo of diligence started out at a reasonably priced location with a commercial grill and began as a social media-based ordering system. Today, the operation is full-time located on 3240 Lone Oak Road and open to the public five days a week. Now it’s time to dive head first into the meat and potatoes (lightly salted of course.) These guys take the steps involved very seriously. Besides, who can afford any missed steaks? The manager arrives at about 5:00 AM to throw the meats on the smoker as well as perform some other necessary opening tasks in order to prep for the meal prep’s prepping (say that 10 times fast.) Eventually, other workers begin to trickle in and help with the cooking and organizing processes. Cooking generally takes a full day on Sunday and a half-day on Monday. The food is prepared one meal at a time, meaning they don’t cook and portion all the food at once. 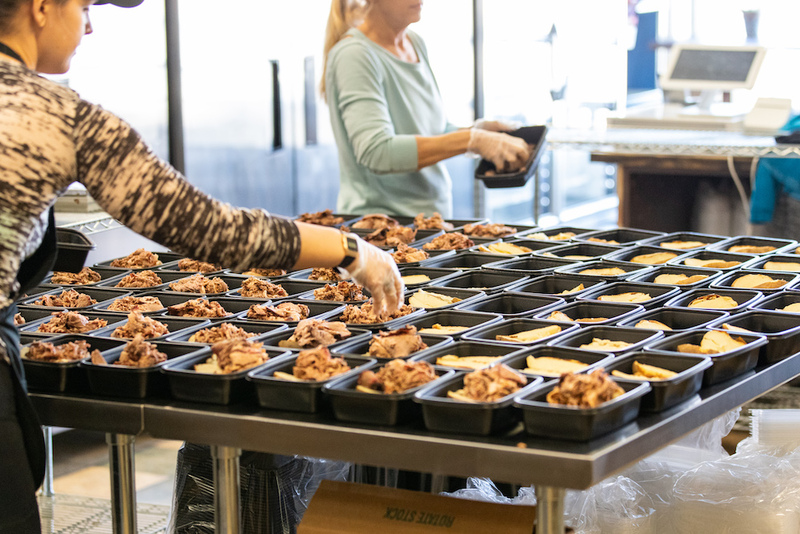 They cook it, weigh it, portion it into containers, package them with lids, add stickers, and then split the meals into what has been ordered and what will be going into retail. Once the cooking processes are complete, all the orders are portioned out. The food is then bagged, labeled, and ready for pickup for the rest of the week. So what kind of meals can you expect to pre-plan for the weeks ahead? Good question! Paducah Meal Prep offers 5 unchanging signature meals and two specials that rotate every two weeks. In the beginning, these meals were mainly centered around the bodybuilding and fitness communities. The specials were not quite as strict as the signatures, however, they still offered a slightly healthier option than the alternative. Over time this dynamic shifted toward a broader audience adhering to more of the general public (not just the barbell bending beefcakes and “gainz” garnering gym girls.) These premium options are still available but are now presented as more of a specialty for those who want a little more bang for their food box. When asked what the crowd favorite was, it was revealed that the heavyweight PMP champion was the Smoked Sriracha Turkey Meatloaf (which even sounds like a tastebud knockout). This meat concoction consists of oats, ground turkey, and fresh peppers. It is then hickory-smoked, topped with sriracha sauce, and coupled with rice or other vegetables on the side. When it comes to variety, Paducah Meal Prep is no chump. You’ll see a wide range of food variations including, green beans, steak, chicken, broccoli, potatoes (regular, red, and sweet), turkey, roast beef, brisket, rice, and more. The most ordered signature meal is the chicken, rice, and green bean combo. They make sure to smoke their chicken in different ways to mix things up a bit from time to time. According to Nathan, there are several advantages of choosing to meal prep over other means of consumption, the first being convenience. Not only will you save money by doing this rather than eating through all your hard earned dollar bills (which don’t taste anywhere near as good as they smell by the way), it’s also going to be healthier. Even the salad option at your favorite fast food joint can have more sugar and calories than some of the other greasy menu items. Not to mention the “healthy” alternatives at most restaurants are usually more costly. It’s extremely difficult to eat the same thing every time, even for the more strict amongst us. Change things up! Education goes a long way in both the food industry and in the world of nutrition. Look into best practices as well as new ways to cook (grill, bake, sear, etc.). This can produce a multitude of different flavors for the same foods minimizing your risk of getting bored, and giving up, and binging at your favorite pizza joint. Nathan also owns Kentucky BBQ Supply in downtown Paducah by the riverfront, so if you haven’t been, make sure to check it out! Around the year 2028, He also plans to start a brisket and beef-based BBQ sports bar/restaurant. Best of luck to all of you out there still clinging to your resolutions! With the right diet in place and food on your plate, you CAN accomplish your goals! All it takes is faith, determination, (and sometimes a little help from Paducah Meal Prep).